This, of course, is yet another one of those movies that stays with me, I can remember where I was when I saw it, who I saw it with, and all the excitement that sprung up around it, filling my young life with, to that point, unparalleled excitement! George Lucas’ original trilogy comes to an end with this film, a very enjoyable stop on the 101 Sc-Fi Movies list. The action sequences are spectacular, especially the final massive assault on the second uncompleted Death Star, there is something happening everywhere in every part of the screen! The action, coupled with the immortal score by John Williams allows me to gloss over some of the things that even as a kid I wasn’t entirely always a fan of… the family film nature of introducing the Ewoks, little teddy bears basically. Oh well, for all that, it’s still a great film, nowhere near as revolutionary as New Hope, nor as dark as Empire, but still a helluva ride to the end. Han Solo (Harrison Ford) is rescued from his frozen state by Princess Leia (Carrie Fisher), Luke Skywalker (Mark Hamill), Chewbacca (Peter Mayhew) and Lando Calrissian (Billy Dee Williams) as well as the ever reliable droids C-3PO (Anthony Daniels) and R2-D2 (Kenny Baker). Upon their return to the rebel fleet, they learn of the Emperor’s (Ian McDermid) and Darth Vader’s (David Prowse) new battle station, and go their separate ways to lead a variety of assaults in a final blitz. 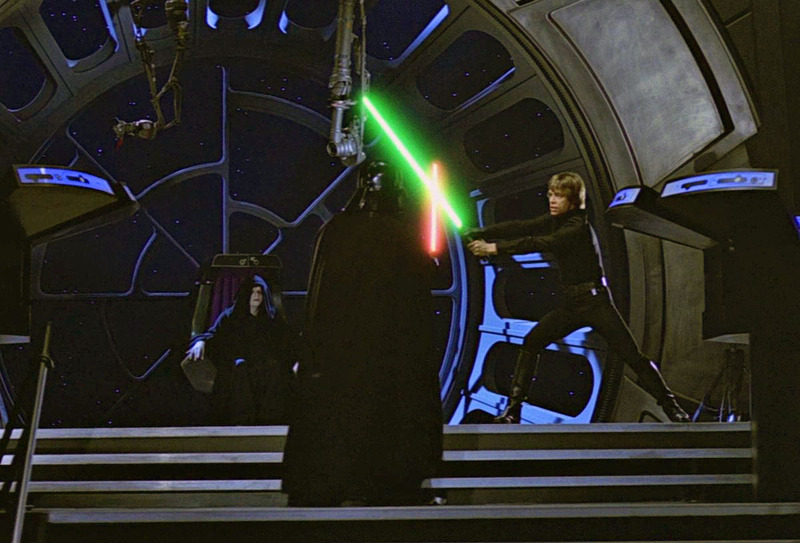 Luke goes to face the final hurdle of his training, confronting Vader. 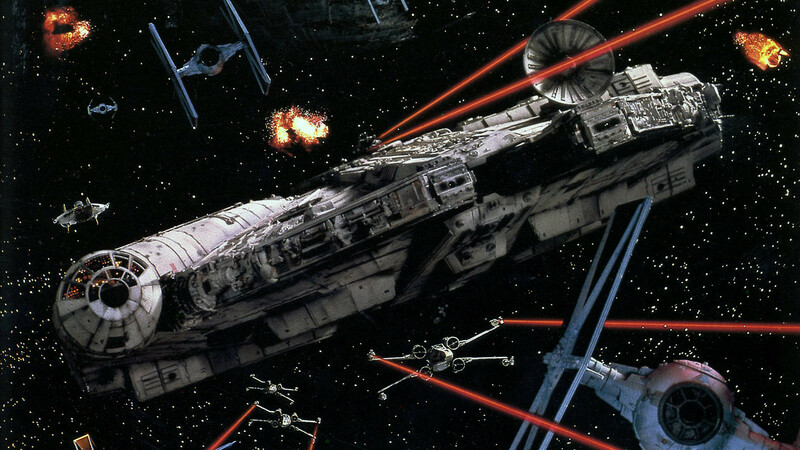 Calrissian helps lead the fleet on its attack on the Death Star, and Solo and the rest rush to deactivate the Death Star’s shield generator on the surface of the forest moon of Endor. All of the effects are practical, there are paintings, model work, explosions, there’s a wonderful reality to it that still fires the imagination. Sure it doesn’t fire me up like it did when I was a kid, riding my bike (which would alternately be the Millenium Falcon, a X-Wing, or a Colonial Viper) whipping through my neighborhood. But the memory of that childhood intertwines with my love of the film, making the two of them inseparable. 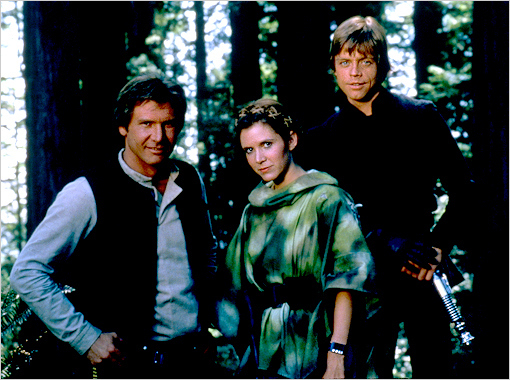 Star Wars, and its initial sequels came along at just the right moment in my life, much like many of my friends. It helped us define who we were, helped shaped my love for movies and movie-making. These were the first films I’d seen that had me wondering how they did all the things I saw on the screen, and I remember devouring issues of Starlog and books on the making of the films. Everytime we rented a video machine of any sort before we purchased a VHS player, we’d have to rent a Star Wars movie (my parents never seemed to understand it, but at least I got to watch it again!). They were also the first movies I bought when I moved out on my own, so I would have my own copies. My ipod often takes me on a journey through the musical cues of the films, and I know the movies and the music so well, I can hear the dialogue and sound effects in my head as I listen to it. These and some of Spielberg’s films will be the first ones I introduce my kids to, if I have any. What are your favorite memories that center around the original trilogy? And how has it affected your life?